The Good Lobby is a civic start-up committed to equalize political power and influence by fostering bottom-up civic capacity via new, cross-societal forms of collaboration, such as skill-sharing. WHAT’S YOUR CITIZEN LOBBYING STORY? YOUR VOICE AND ADVOCACY SUCCESS STORY MUST BE HEARD. It is time to celebrate the thousands of individuals and organizations committed to causes they care about. 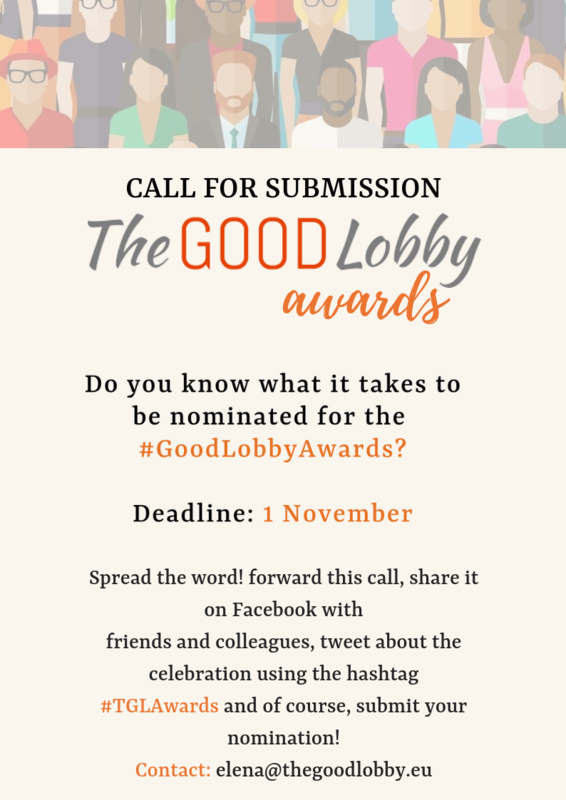 Share your story at The Good Lobby Awards to inspire many more citizens and organizations to lobby for change! Take a look at winning stories from last year’s TGL Awards. The Good Lobby Awards is an annual celebration of citizen-driven projects, initiatives and campaigns. The Awards bring together and celebrate individuals from different walks of life and organizations that have been successfully championing social change. The upcoming deadline for nominations is November 1! The Award Ceremony is expected to take place in Brussels in December. Please spread the word – forward this call, share it on Facebook with friends and colleagues, tweet about the celebration using the hashtag #TGLAwards and of course, submit your nomination through this form. Please spread the word, we could reach many organizations that have a project to submit through your network! Invite your members and your partner organizations to submit their nomination through this form! Collaboration of the Year Award rewarding joint public interest work carried out by several professionals, NGOs, grassroots movements, philanthropies, political representatives or citizens in the European space. All projects be they local, national or international are eligible for the Awards. Multiple submissions are accepted.